Sweater is a cozy fashion item. It can be stylish and cool but most of the time a sweater could use some styling that would make it less homey. Statement necklaces and collars may work but they are so last couple of years. Here are the 5 ways of dressing up your sweater in a trendy way. Long lace top under a cropped or regular sewater is a great way to bring glamour into winter. Choose a contrasting or matching lace top and make sure its hem peeks from under your sweater hem. The same can be done with a sheer top. Make it assymetrical too as it’s quite trendy right now. Peeking cuffs too look very glamorous. We love the lace ones but any blouse cuffs can do. 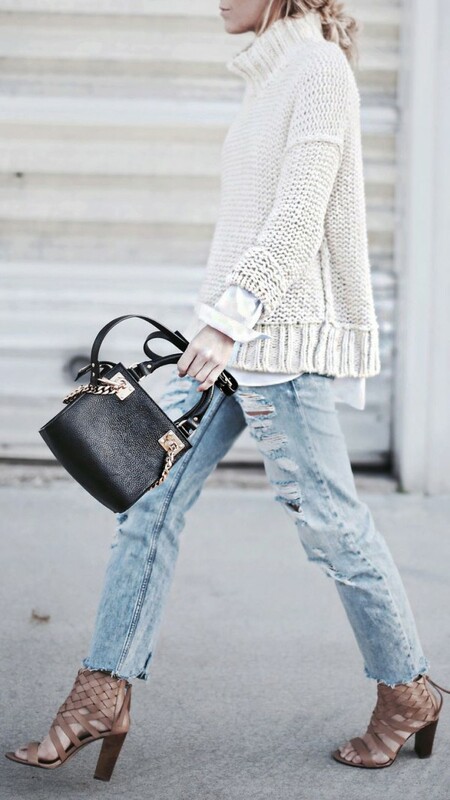 If you are DIY savvy you can easily transform your sweater into a fashion must-have with a side slit. These aren’t just for skirts now. Wearing a sweater with a pencil skirt or a flirty skater short skirt may not be very winter weather-friendly but it definetely makes for a glamorous look. Don’t be afraid to experiment, especially with the oversized sweaters that are so trendy this season. It’s an outfit from pursuitofshoes.com blog, November 2014 entry.